The appearance of these cookies on my holiday tray began as a fondness for the person who introduced me to them. I'd never had them in Chicago, and when we moved east I was still of an age where I thought I knew everything. Yvonne, whom we met through an old-fashioned letter of introduction, was determined to show me how mistaken that notion was. She was French and charming and had an accent that would make the angels sing. She was also a natural born teacher. Her original mission was to teach me needle work, but when that didn't work as she planned, she took me into her kitchen. 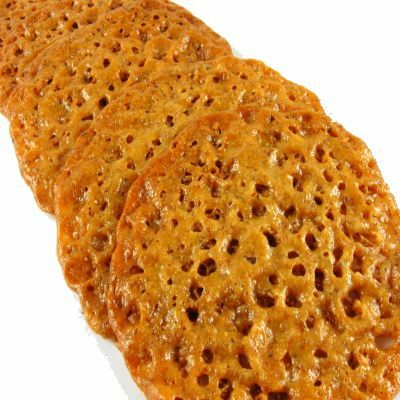 That visit led to a Christmas that would include our first Paris Brest, a Bouche de Noel and these lovely lacy Florentines. Contrary to popular belief, these cookies are not Italian. They've been traced to the kitchens of Louis XIV where they were made for visiting Medici princes who took them back with them when they returned to Florence. Of all the cookies I've prepared for the holidays, these are my favorites. I love the way they look and smell and taste. While we eat ours out of hand, it is not uncommon to see them drizzled with chocolate. I love chocolate but I don't think it adds anything to these cookies. If you try the recipe, or are a fan of Florentines, I'd love to know how you feel about using chocolate to finish them. If you've never made them, there is one truc you should be aware of. Even though you bake the cookies one tray at a time, the dough must be dropped on cookie sheets while it is still warm. Once it cools it will crumble and become unworkable. So, while you'll bake 6 cookies per sheet, you'll form all sheets as soon as the dough is cool enough to handle. I think you're going to love them. I have a cookie monster, now in his 7th decade, who lives in my house and shares my table. I have to hide these from him because, left to his own devices, he will eat them all in a day or two. These are really good, so instead of talking, let's preheat the oven and get to it. 1) Preheat oven to 350 degrees F. Position two oven racks in the middle and upper third of oven. Line two cookie sheets with parchment paper. 2) In a food processor, grind almonds finely; measure out 1/2 cup and set aside. It is also possible to buy ground almonds for use in this recipe. 3) In a medium saucepan over low heat, heat the butter, brown sugar, granulated sugar, and corn syrup until the butter melts and the sugar dissolves, stirring often. Increase the heat to medium high and, stirring constantly, bring mixture JUST to a boil. Immediately remove pan from the heat and stir in flour and salt until incorporated. Stir in ground almonds and vanilla extract. 4) Drop batter using a teaspoon, 3-inches apart, on prepared cookie sheets (about 1/2 dozen cookies per cookie sheet). Prepare all your pans of cookies at this time even though you are only going to bake 1 or 2 sheets at a time. 5) Bake cookies until evenly light brown, approximately 8 to 10 minutes until cookies spread, become thin, and take on a deep golden color. If you are using 2 cookie sheets switch top to bottom and back to front at 5 minute mark to promote even baking. Cookies will begin to spread 6 minutes into baking time. 6) Line wire cooling racks with plastic wrap. When cookies are done baking, remove cookies from oven and, as soon as they're firm enough to lift off baking sheet (which will take just a few minutes), use a wide spatula to transfer them to prepared cooling racks to cool completely. Allowing cookies to cool slightly on cookie sheets will also cause them to flatten out more. NOTE: If cookies become too cold and hard to remove from baking sheet without shattering them, replace pan in the oven to soften the cookies again. Bake remaining cookies; batter will have firmed up a bit, but that is fine. Store flat cookies between sheets of parchment paper in a tin or plastic container with a tight-fitting lid. Yield: 25 to 30 cookies. When I read your posts, as you talk about your recipe you really make me want to try it even if I wandered over thinking it( recipe ) would not be of any interest to me. Now I want to try this!And I probably will, if I say I will try a recipe I usually do get around to doing so. BTW, have you ever watched the movie 'Babette's Feast'? For some reason this post brought that wonderful movie to mind....my husband and I watch it this time of year. Thanks for the recipe, I'll add it to my book. Every year I always intend to make Florentines but somehow they get left until the last minute and I run out of time. These cookies are my favorites as well. No chocolate. No anything. Just cookie. These look perfect, a great, beautiful addition to any cookie tray, so delicately pretty! I love florentines but have never made them. Somehow you make them look so easy! Wow, these florentines look amazing! I'm saving this up too. Thank you so much! 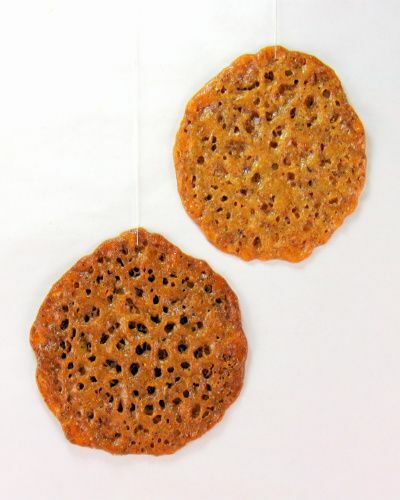 Your Florentines are so uniform in size and shape! Wonderful! I have always drizzled my chocolate of choice--dark--but you're right that they stand on their own. Being of Italian heritage, I may not accept the Medici theft, lol. They look lovely! I have never tried them before, so lacy and delicate. Gorgeous looking cookie - I have read about these but have never tried them! PS: Congrats on Connor - always nice to have a newborn this time of year!! ps--I just saw the picture of the baby!! What a Christmas blessing. As Melanie says in GWTW-"The happiest days are when babies come" Congratulastions to everyone! Your florentines are perfect, Mary. This is a favorite in my family. You've reminded me that I must make some. I made a similar recipe with pecans last week. I've never made these and have never tasted one, but they look beautiful and yummy! These cookies look marvelous and so tempting ! You have me sold on these cookies. I am really loving the alomond. Connor is adorable congratulations! Joshua is a real cutie too! All of you must be on Cloud 9. Dana, welcome to One Perfect Bite. I hope you'll stop by often. What an interesting story! I never knew the origins of this cookie. I keep saying this, but it's true-- I'd love to make these. I've only had them chocolate dipped, but I believe you that it's not necessary. Mary, I so enjoyed your personal story behind these cookies, such a wonderful memory and it makes them extra special. I have such love in my heart for all those who have taught me to bake and cook over the years. You know your on that list now, your recipes are always my favorite new finds. Congratulations on your new family member, Connor. My nephew and his wife just welcomed their firstborn on the 5th, a son, and he weighed in at 9 lbs. 2 oz. I love big babies, my son was 9 lbs. 13 oz. almost 40 years ago. Merry Christmas Mary to you and yours. Beautiful, as always! Just stopping by to wish you a wonderful Christmas. Congratulations on your family's wonderful holiday blessing. I can always depend on you for an extraordinary post:) I have a Connor as well...I'm sure you've been introduced to him:) Congrats. I hope you will link this post to Merry Merry Munchies. I made a version of these yesterday. I always thought the Spanish and Italians fought over who inventeed them. Then, in march the French! Love it! I love these cookies - I haven't had them for much too long. I love the look of this cookie...I can see why your "cookie Monter" would love these, Mary! I love florentines although I will confess to loving them w/ chocolate and the rolled ones with the cream inside too. Golden lace, so beautiful. Definitely without chocolate! I've been checking out your cookies here ... mmmm, yum. If I were your neighbour I'd be popping in regularly for coffee and .... anything you've baked, lol. Is there a way to leave out the corn syrup from this recipe? I would love to make them but don't have corn syrup.